An apple a day may not necessarily keep the doctor away, but it may help you manage gout symptoms -- provided you eat the fruit in moderation. Gout causes joints to become swollen and painful because of a buildup of uric acid. Uric acid is produced by your body when you consume foods containing purine compounds. Too many high-purine foods leads to excess uric acid, resulting in the development of gout or an increase in the severity of gout symptoms. Apples contain compounds that may help treat gout -- as well as others that may worsen the condition. 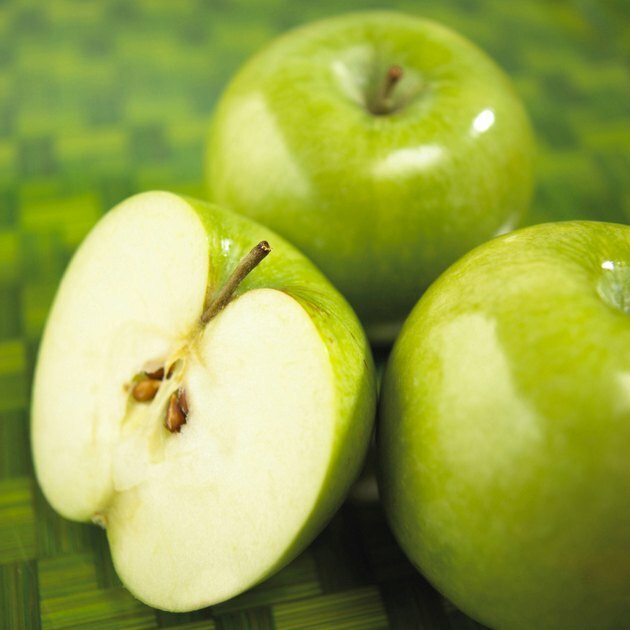 All types of apples are considered low in purines. Low-purine items contain less than 50 milligrams of purines in every 100 grams of food. On average, an apple has just 14 milligrams of purine compounds per 100 grams, meaning that a large 223-gram apple contains approximately 31 milligrams of purines. Applesauce, apple juice and dried apples are also low in purines and allowed on a gout diet. Other acceptable low-purine foods include most vegetables, low- or nonfat dairy products, rice, bread, pasta and all fruits. A diet with a high intake of vitamin C appears to lower uric acid levels and may help prevent and treat gout, according to an "Arthritis and Rheumatism" study published in 2005. Men should have 90 milligrams of vitamin C each day, while women need approximately 75 milligrams. One large apple contains 10.3 milligrams of vitamin C, or more than 11 percent of a man's requirement and nearly 14 percent of a woman's. Including apples in your diet could help you reach the recommended daily allowance. However, because the 2005 study evaluated supplementation with 500 milligrams of vitamin C per day, diet alone may not provide sufficient levels of the nutrient to be beneficial for gout. If you have gout, aim to consume two to four servings of fruit each day, advises the University of Pittsburgh Medical Center. A medium-sized whole apple, 1 cup of sliced or chopped apples, 1 cup of apple juice and 1/2 cup of dried apples all count as a single fruit serving. Avoid apple products with added sugar, such as sweetened applesauce, and choose only 100 percent fruit juice. Because fruit juice is high in sugar and low in fiber, drink less and eat whole apples with the skin intact more often. Apples contain a large concentration of the naturally occurring sugar fructose. A study published in the "British Medical Journal" in 2008 demonstrated that a high intake of fructose -- including fructose from fruits like apples -- was linked to a greater risk of gout in men. This may occur because fructose increases uric acid levels. Ask your doctor how often she recommends you eat fructose-rich fruits such as apples, grapes, watermelon and peaches while you're managing gout. ChooseMyPlate.gov: Fruits - What Counts as a Cup of Fruit?